This is the same Betsy DeVos who some media outlets told us just before her confirmation hearings had gone through some sort of transformation, or was always, in fact, supportive of LGBTQ rights and was simply misunderstood. It was an odd, convenient narrative coming at a time when she needed it. As with Trump himself, just because Betsy DeVos might help out her well-off Republican gay friends ― who might return the favor by helping her in other ways ― doesn’t mean she’s not devoted to her family’s longtime goals, nor to putting religious beliefs before LGBTQ rights. While she gave McNalley and his husband a reference letter in their successful effort to adopt a child as gay parents, she also financially contributed to the campaign of GOP legislator Andrea LaFontaine ― a zealous religious conservative ― who spearheaded a draconian Michigan law passed in 2015, weeks before the Supreme Court’s landmark marriage equality ruling, that allows state-funded faith-based adoption agencies to turn away gay and lesbian couples based on their sexual orientation. That law seems right in line with DeVos’ statements yesterday, refusing to rule out giving federal money to schools that discriminate against LGBTQ students and parents. DeVos has said in the past that she wanted public education to “advance God’s kingdom.” . . . . she was listed as a vice president of her mother’s foundation, which is a major donor to anti-LGBTQ hate groups Focus on the Family and Family Research Council. 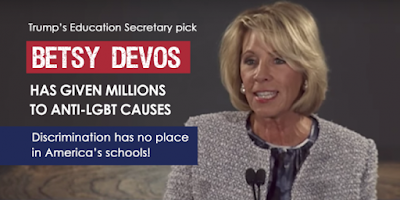 DeVos claimed during her confirmation hearings, “I fully embrace equality” and rejected “conversion therapy,” which is promoted by many of the groups to which her family donates. But once in office, DeVos went right along with the Trump administration action of rescinding guidelines for the treatment of transgender students, put in place by the Obama administration. And now we have her clear statements on allowing schools to get federal funds even if they discriminate against LGBTQ people ― or any group.